They are by 布施知子 /FUSE Tomoko and I had to post them decently before doing the washi version. The smaller has 12 double units and the bigger 30. 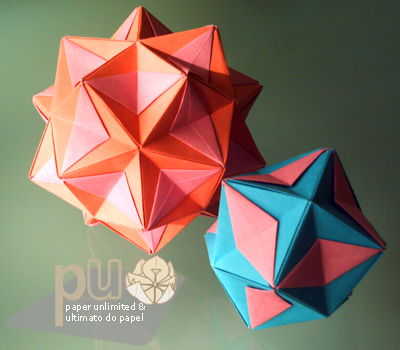 These sonobe-like units are made from 1:2 paper and each finished unit is made up of a base unit and a face unit. In these particular kusudamas the base is the base colour unit and the face unit, the diamond shape unit. 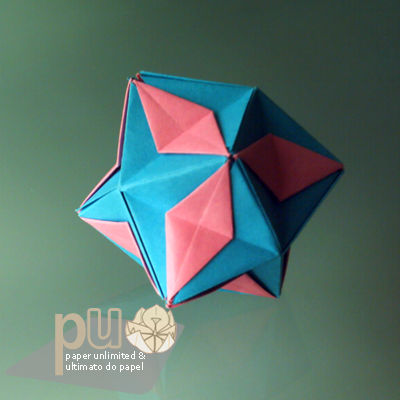 These units were made by colourful 8×4 cm /3.1×1.6″ paper of 70g/m2. The smaller one can be made without glue but on the bigger one I used a bit of glue. It’s hell to assemble without glue however I believe it is possible. 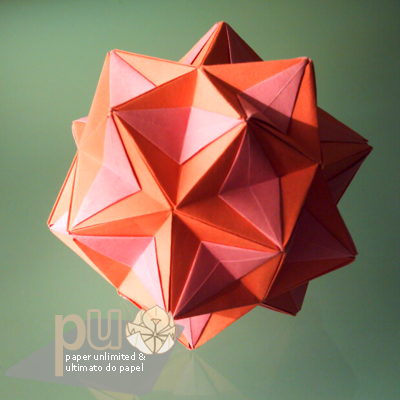 This entry was posted on 2008|02|06 at 17:26 and is filed under kusudama, kusudama (glued), modular origami. You can follow any responses to this entry through the RSS 2.0 feed. You can leave a response, or trackback from your own site. In the English version of the book it is called Rhombic Patches. Do you have diagrams for these or do we just buy the book? Do you have links? THanks for posting all your wonderful creations. The photography is just amazing and it’s a real joy to see such beautiful kusudamas and sonobes. Hi!!! It’s cute, where I can find the diagrams??? Con you send them to me?? Please!! !